Business owners are given wide latitude as to how they set prices for goods and services. The California legislature has cracked down on businesses who engage in inaccurate and deceptive pricing practices. Under California Business and Professions Code Section 12024.2 BPC, engaging in inaccurate or deceptive pricing is a criminal offense that can potentially be filed as a misdemeanor. OR charged an amount greater than the lowest priced posted on the commodity itself or on a shelf tag that corresponded to the commodity, notwithstanding any limitation of the time period for which the posted price was in effect. When more than one price for the same commodity is advertised, posted, marked, displayed or quoted, the person offering the commodity for sale must charge the lower of those prices. Pricing maybe subject to a condition of sale, such as one requiring the buyer to be a member of a store-sponsored club, requiring the buyer to purchase a minimum quantity or requiring multiple purchases of the same item. In these cases, the condition must be conspicuously posted in the same place as the price. A man owns and operates an electronics store. The man advertises a sale in the local newspaper during which all items will be 50% off the normal retail price. Because of the advertisement, many customers flock to the man’s store to take advantage of these deals. 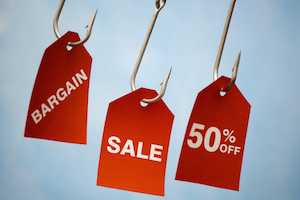 However, the advertisement is simply a ploy to attract customers, and while the man offers significant discounts on the products, he does not sell items for 50% off the retail price. This man could be charged with inaccurate pricing pursuant to California Business and Professions Code Section 12024.2 BPC. In another example, a man is shopping at a local grocery store when he sees that his favorite brand of cereal, which usually sells for $3.99 a box, is on sale for $1. The man selects one box and brings it to the cash register for purchase along with his other items. While reviewing his receipt, the man notices that he was charged $3.99 for the cereal, and not $1 as he anticipated. The man complains to the store manager, who tells him that the $1 price only applies when a minimum of four boxes of cereal are purchased. The manager shows the man how this condition was written under the $1 sale price. The store would not be guilty under California Business and Professions Code Section 12024.2 BPC as long as the condition was conspicuously placed. As discussed above, if the pricing scheme was subject to a condition of sale, such as membership in a sponsored club or a minimum purchase, the defendant would not be guilty of this offense as long as the condition was conspicuously posted in the same place as the advertised price. Where the violation was willful or occurred as the result of gross negligence or where the overcharge amount exceeds $1, this offense is a misdemeanor. Those convicted can be sentenced to a year in jail and a fine of up to $1000. Where the overcharge amount was less than $1, the offense is an infraction that is punishable by a $100 fine. If you have been cited for inaccurate or deceptive pricing, it is very important that you speak with a Los Angeles Criminal Defense Lawyer immediately. Los Angeles Criminal Defense Attorney Michael Kraut is a former Deputy District Attorney with over 14 years of prosecutorial experience. In many cases, Mr. Kraut early involvement in a case has resulted in charges being declined or significantly reduced. For more information about inaccurate pricing, and to schedule your free consultation, contact Los Angeles Criminal Defense Attorney Michael Kraut at the Kraut Law Group located at 6255 Sunset Boulevard, Suite 1480, Los Angeles, CA 90028. Mr. Kraut can be reached 24/7 at 888-334-6344 or 323-464-6453.